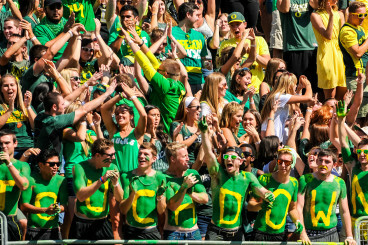 Who Has It Better at Autzen – Students or Alumni? As I write this article, I am also preparing for my family to fly into Eugene for my graduation from the University of Oregon. While my career at UO has come to a close, I, along with the rest of the Class of 2015, will join the exclusive life-long club of Oregon alumni. While we will no longer attend classes or spend our Thursday-Saturday nights at Taylor’s, there is one thing that alumni and current students will always be able to share: Autzen Stadium. I have been struggling to come to terms with the fact that I will no longer be able to go to games for free, walk to the stadium from my off-campus apartment, and take part in the famous Autzen student section. There is, however, a silver lining for the upcoming alumni who will have a much different experience at Autzen come next season. I am here to argue that, in some respects, going to a game as an alumnus could be considered even more enjoyable than going as a student. Here’s to the best fans in college football year after year. This is a big one for me and for anyone who has ever gotten the shaft from the university’s student ticket system. For those who are older and are unfamiliar with how the current student ticket system works, here is a little overview. Student tickets are released the Sunday evening before a game on Goducks.com and are available in order of seniors to freshmen. Once the clock strikes, thousands of students will simultaneously try to claim a ticket as their own (most of whom are using the same UO Wi-Fi). Most people will end up getting stuck at the refreshing screen, screaming obscenities at their computer. Granted, the tickets ARE free for students, but the frustrations don’t end there. Just like the ticket system, the seating system is first come/first served. 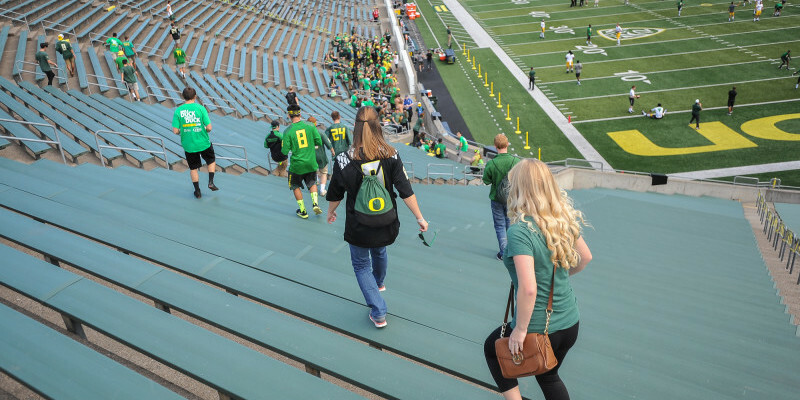 Hordes of students show up to Autzen Stadium five hours early just to get in the front row. To those students who are dedicated enough to show up those five hours early, kudos to you. But as a member of the alumni, who like to take their sweet time tailgating, I think the notion of having a reserved seat will be refreshing. 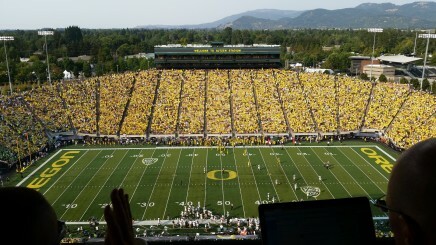 This is a much better angle of Autzen. The student section does have its perks. You are next to the loudest people in the entire stadium, you are with all of your friends and you have a good chance at getting on national television! Let us be realistic, though — the view from the student section is less than desirable. Buying a ticket as a non-student offers options to sit with a more central view of the field. Additionally, the student section has no cover from the sun. It never rains in Autzen Stadium, but during the first couple games of the season in September, it gets extremely hot. For obvious reasons, alcohol is not allowed in the student section of Autzen Stadium. 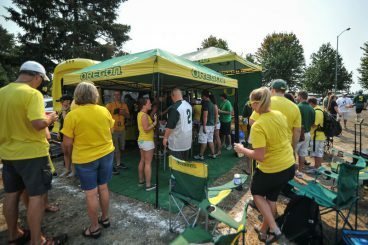 For the alumni in the rest of the stadium, however, there is nothing like enjoying an ice-cold Oregon-brewed beer while watching a Duck game in the shade. Who does not love tailgating? While it is not uncommon for students to tailgate, it is less likely if on a college budget. Alumni tailgates are where the real fun is. Of course, this comes from alumni having more disposable income than your average college students, who may or may not have part-time jobs. Do you think you could have afforded a bus like this in college? 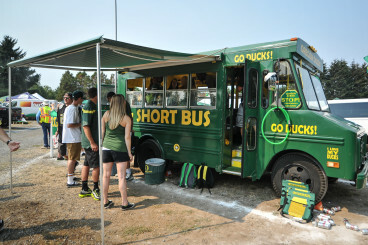 Among everything else, a trip to Autzen will serve as a nostalgic trip for alumni. Some of the most memorable moments in my life were spent in the student section. Returning to Autzen as a graduate and alumnus is sure to invoke memories of walking across the Autzen Bridge, taking pictures in front of the Oregon O, and participating in the 4th quarter “shout” tradition. Of course, it is unrealistic to expect an alumnus to have the time and money to go to every home game in a season. Even if you are watching the Ducks on television at a bar, at home or even on your phone, the memories of Autzen Stadium will always be in the hearts of lifelong Ducks.